Ancore of Genesis (AHR 32466-12) is the 6th foal to be born from a favorite and well-known Genesis Farm breeding cross consisting of Arno van het Nieshof and Mint Julep MLF. Arno van het Nieshof is of almost mythical proportions in the world of the haflinger breed. Arno bears little introduction as one of only two stallions in North America to earn his AHR ‘Elite Stallion’ status and the only stallion in North America to earn the AHR ‘Supreme Stallion Status’ based on the merits of his offspring. Arno was imported from Holland as a yearling by Genesis Farm. Since entering the United States, Arno has been named the two-time American Haflinger Registry ‘National Champion Stallion’ as well capturing FOUR consecutive ‘AHR Stallion Of The Year’ titles. Perhaps even more impressive though is Arno’s ability to pass on his superior attributes to his offspring and this uncanny ability is witnessed time and time again as his offspring win in show rings around the country and consistently earn the highest scores through the AHR Inspection and Classification program. Mint Julep MLF is an exceptional broodmare that is sired by former National Champion, Nobleman TOF. Her dam was the now deceased great producing mare, Moxie NTF. Mint, who was bred and owned by Bob and Bea Wallace of Meadowlane Farm in Hemlock, Michigan, has a winning legacy. She was the winner of her GLHA Futurity classes as a weanling, yearling and then again as a two-year old! Ancore had some big shoes to fill as through the years, all of his full-siblings have placed well in the show ring and through the AHR Inspection and Classification program. Notably, two of Ancore’s full siblings have been former AHR SIP pleasure Overall Champions! Ancore did not disappoint us in his show ring debut at the 2012 AHR Futurity. 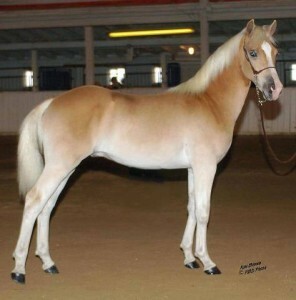 Competing as a gelding in the colt division, he was the 1st place Senior Weanling Colt. He then went on to be named Reserve Junior Champion Foal (only in Reserve to his half-sister and barn-mate, “Rumor Has It of Genesis”). In the SIP Pleasure division, out of over 20 entries, Ancore came in 2nd place, just behind “Rumor Has It of Genesis”. Arno’s foals claimed the 1st and 2nd place awards in this competitive division. Most incredulously, four of the five Genesis Farm entries were lined up 1st, 2nd, 3rd and 4th place, which is the epitome of a consistent quality breeding program! We look forward to hearing about Ancore’s future as a performance gelding representing the haflinger breed. As serious breeders and promoters of the haflinger breed, at Genesis Farm we realize that the future of our breed relies on the best quality haflingers being showcased by private individuals at competitions throughout the country. In this manner, the general public can see what a quality haflinger should look like and the level at which these quality horses can perform against other breeds. Ancore is the perfect example of this and we wish his luck in his future performance endeavors!